Superyacht sales in January showed a strong start to 2015, trumping start-of-year tallies for six years past. New orders stayed strong and figures in many categories continued to feature seriously big superyachts. We know of 27 superyacht sales in January, the best start to the year since the global financial crisis. It was up 10 on January 2014’s tally, if only one on December’s. The largest sale was 52.3m 1986 Feadship motor yacht Calixe, followed by CMN’s 49m motor yacht Mim, launched in 2001 and a classic, the 1930 RS Eden, built by Defoe in the US. The highest asking price was €18,500,000 for the 2013 Codecasa F75. Twenty superyachts came to the market in January, according to our records, compared with 18 in December and 32 in January 2014. The largest was 80.2m Blohm+Voss yacht Golden Odyssey, launched in 1990, followed jointly by Benetti’s 2013 launch Ocean Paradise and Amels 2012 launch Step One, both 55m, with the latter holding the highest asking price, €37,000,000. We have been told of six new orders, on a par with both December’s figure of eight and January 2014’s seven. The largest was a 77m CRN motor yacht, due for delivery in 2017, followed by a 68m from a Dutch yard whose name we cannot reveal. Four of the count were at Italian yards. Thirteen superyachts were launched in January according tour sources, up on December’s 11 and a big improvement on January 2014’s seven. 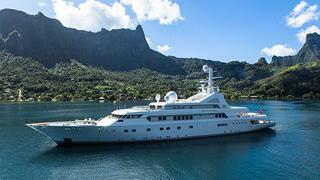 The largest was seriously large – a 101.5m motor yacht known as 808 at Feadship (its largest ever yacht), followed by another from the same yard, 83.5m motor yacht Savannah. The Netherlands had a good run overall, with three other launches among the tally. We know of six superyacht launches in January, down on eight in December and ten in January 2014. The largest was 88.5m motor yacht Infinity from Oceanco. Two Taiwanese motor yachts were among the tally, 33.53m Debbie Lou and a 27.28m known as 84095, both from Horizon.